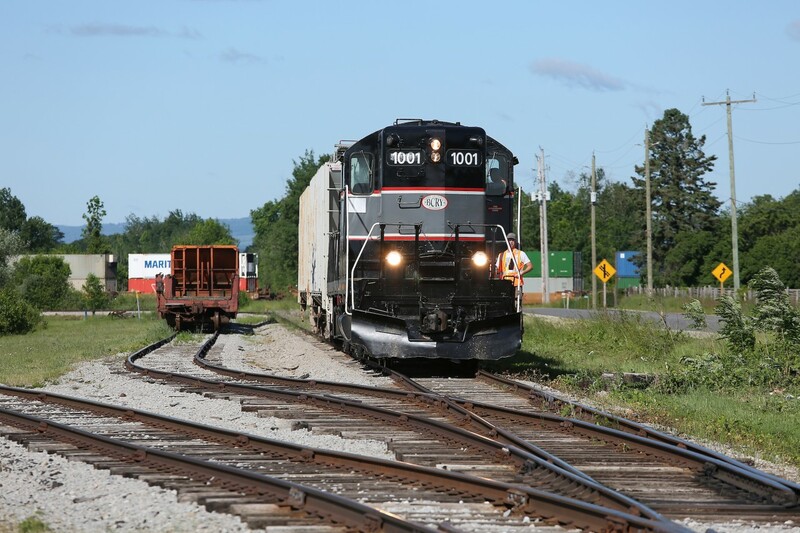 Railpictures.ca - Craig Allen Photo: On a sunny June morning, the BCRY crew has coupled the power to two hoppers and is about to depart the yard at Utopia and head to Barrie for the day. In the background a northbound Canadian Pacific intermodal train is silently crossing the diamond. | Railpictures.ca – Canadian Railway Photography – photographie ferroviaire Canadienne. Caption: On a sunny June morning, the BCRY crew has coupled the power to two hoppers and is about to depart the yard at Utopia and head to Barrie for the day. In the background a northbound Canadian Pacific intermodal train is silently crossing the diamond.